Rising out of the Atlantic Ocean, oblivious of its splendor, are two monolithic rock formations known as the Roques de Anaga. Both the Roque de Tierra (inner Roque) and the Roque de Fuera (outer Roque) are constantly braving the unforgiving waves of the ocean and gracing it with their majestic presence. The rocks are part of the Anaga Rural Park, a Natural Protected Area in the municipality of Santa Cruz de Tenerife. They are home to rare and fascinating vertebrae species, some of which are not found anywhere else in the Canaries. These include the elusive giant lizard on Roque de Fuera, among others. Apart from that, the two islands have been classified as a Special Protection Area for birds as they attract these creatures on a regular basis. Because of its residents and area of geological interest, Roques de Anaga is included in the European Union’s Natura 2000 ecological network of protected areas. The landscapes of the two islands of Roques de Anaga are not for visitors looking for a relaxing day trip. Instead, the steep, rocky and relatively dry surface of these islands entice outdoor junkies and hikers visiting this part of Tenerife. To get to the islands, hikers must start at the tip of one of the nearby villages. With Roques de Anaga in sight, the way to get closer is by taking a scenic boat ride. 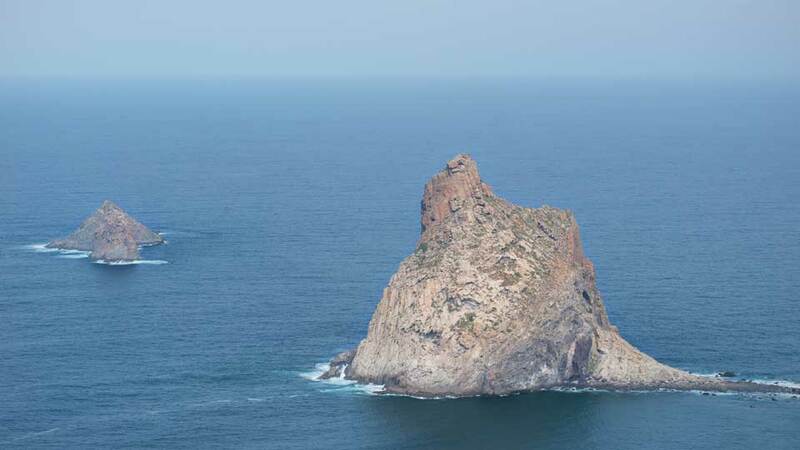 Alternatively, when the tides are at its lowest and the waves are not that strong, it may be possible to walk the isthmus to Roque de Tierra. Roque de Tierra is higher and steeper, standing 179 meters above sea level. It is also a bit larger in land area. Trekking to the peak of this island is no walk in the park, as it requires endurance and physical strength. However, the views from the summit are nothing short of rewarding. From the top of Roque de Tierra, visitors can take delight in the splendid view of the shimmering waters, an old lighthouse on the east side, and the nearby remote beaches. From the inner island, visitors who want to conquer the rest of Roques de Anaga may reach the Roque de Fuera by boat. Roque de Fuera, located further away from the mainland, is more pristine with its flora and fauna. It is also less steep, standing only at 66 meters above sea level. The only inhabitants of this island are endemic species such as Bulwer’s petrel and pardelas. The vegetation on the island is also unique and noteworthy. At the peak is a spectacular clump of almost a hundred species of dragon trees. Rare species of flora also dot the surface of this rocky island. After a day of trekking, what’s more inviting than enjoying some peace and relaxation at Playa de Benijo? The coastline in this part of Tenerife consists of black, volcanic sands that feel fine between the toes. Unspoiled and lacking modern amenities, Playa de Benijo is as tranquil as it can be. The solitude of this beach is enough incentive for travelers who want to avoid crowded spots on the island. Apart from that, the splendid view of Roques de Anaga never fails to dazzle its visitors. In the afternoon, the absolute magnificence of the sun bidding the Atlantic Coast goodbye is the kind that inspires poets and artists. Watching it from the Roques de Anaga is like having a VIP seat at a concert. The unobstructed views of the pink and orange skies are dramatic, and surely an experience visitors won’t soon forget. From Playa de Benijo, the glimmering sea contrasting with the horizon and dark outline of the volcanic rocks rising from the depths of the ocean is pure magic. For convenience, most of the visitors of the Roques de Anaga book group tours as permits may be a challenge to acquire. Even so, guests who want to travel DIY-style are welcome. Visitors wanting to explore the islands on their own must start the journey from Mirador Cruz del Carmen Visitors’ Centre. After obtaining a permit, travel for approximately one hour to El Draguillo by taking the TF-12 then TF-134 motorways. From El Draguillo, visitors may take a boat ride to the islands of Roques de Anaga. There is no bus service from the visitors’ center to El Draguillo but there are several bus stops in the nearby villages. Alternatively, guests who want to check if the passage from the mainland and Roques de Anaga is passable may continue to Punta Baja de Las Palmas. Of course, it would help to track the tides first to ensure that the few kilometer travel would be worth it. Guests should also note that going to Roque de Anaga is no easy task. The road that snakes up from the visitors’ center and then down to Taganana is not for nervous drivers and passengers. However, the 180° hairpin turns, and the white-knuckle ride is all worth it. Jaw dropping sea and mountain view during the drive is a bonus for the brave souls who dare to visit. Visitors will starve after an arduous day of exploring the Roques de Anaga. While it is recommended to pack food during the hike, it would also be great to have some delicious dining as a reward at the end of the trip. There are no establishments in either of the two islands so that guests may choose from the quaint restaurants in Playa de Benijo. Situated on a cliff top and overlooking the sea, this restaurant boasts scenic view and good food. It offers a variety of seafood, Mediterranean, and Spanish cuisines and alcoholic beverages. There is a parking space available, and the restaurant accepts major credit cards. From the road, this often-overlooked restaurant looks like an awning over some tables and a car park. But the tables under the awning have the most spectacular view of Playa de Benijo. La Venta Marrero serves delicious Spanish cuisines and is wheelchair accessible. Sitting almost at the end of the road is El Fronton Restaurant. The food does not disappoint with its choices of seafood, Mediterranean, Spanish cuisines. Aside from outdoor seating which provides stunning views of the sea, this restaurant is also known for its excellent service. Roques de Anaga may not have the amenities of other modern attractions in Tenerife, but the serenity and excitement it brings is enough incentive for travelers. The feeling of being at the tip of a vast mainland is explicit, and the unobstructed views of the Atlantic Ocean are next to nothing. Indeed, Roques de Anaga is not everyone’s cup of tea. It requires good physical condition, guts to take a white-knuckle ride by the coastline and patience in getting a permit. Nevertheless, the experience of exploring the emblematic natural monuments is an adventure visitors won’t soon forget.